Scuba Diving in Costa Rica is something everyone should have on their bucket list. Just as Costa Rica is known for its bio-diversity on land, the aquatic life below the sea is incredibly diverse as well due to the underwater volcanic rock formations. Costa Rica welcomes all scuba divers from novice to expert, and our Tamarindo Scuba Diving trips offer something for everyone too! Not certified yet? What are you waiting for? Come learn to dive in our PADI 5 Star Facility in Tamarindo. The water conditions of Costa Rica are ideal throughout the year and the Pacific Coast of Guanacaste is one of the best places to learn to dive. You can get your feet wet with our Tamarindo Resort Course, or dive right in and get your full Open Water Diver Certification in Tamarindo. Already certified? 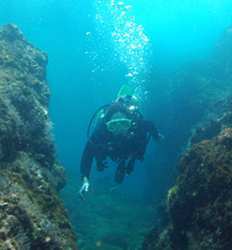 Guanacaste is home to some key dive areas in Costa Rica, one being the Catalina Islands which is a short trip from Tamarindo. Scuba Dive Islas Catalinas for a chance to find white tip sharks or giant manta rays and the gentle sea turtles that migrate here to lay their eggs on the shores of Guanacaste beaches! Go ahead and check out our Tamarindo scuba diving trips and certifications below, then dive right in and book your Tamarindo Scuba diving trip today! 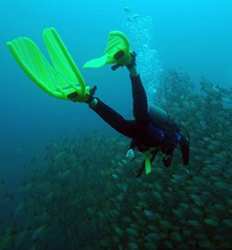 Our 2 tank scuba dive to the Catalina Islands offers an amazing underwater experience for all skill levels of divers. Catalina Island chain is a series of rocky outcrops 2-8 miles off the Pacific Coast of northwestern Costa Rica. We offer you discounted Scuba Diving packages in Tamarindo, so book your dive ahead and save some cash! Did you have the time of your life scuba diving in Tamarindo? 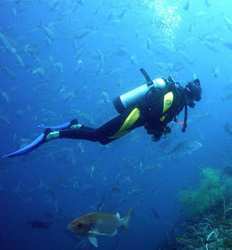 How about a Discover Scuba Diving Resort Course in Tamarindo? The best part of a Scuba Dive Resort Course is that you have the option to purchase as many more dives as you like with the same dive shop during your stay. You can even sign up for your dive certification in Tamarindo. If you are thinking about getting your scuba diving certification in Costa Rica, Tamarindo a great place to learn to dive! 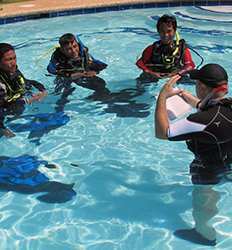 The SSI or PADI Open Water Certification course is the most popular entry level scuba certification course. The Open Water Diver course provides the fundamental knowledge and skills you need to scuba dive safely.